It's been a while since I have posted. Even though I have been working on projects for Christmas, there has not been much to take photos of or post. I think I have shown about everything I have in my little abode and at times it's hard to come up with something that I think anyone would be interested in. After 4 plus years of blogging, I guess that would be kind of normal as I notice that some of the bloggers I have followed for years are letting longer periods of time go between postings. So for today I am going to show you a couple of projects I saw on Pinterest that caught my eye and would be something I would do. 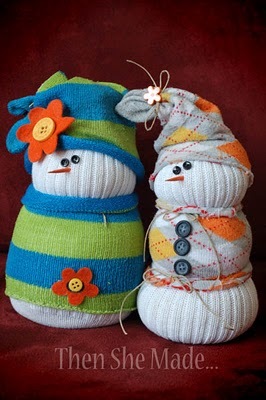 Especially the sock snowmen above!! Cute, cute, cute. I think I am going to find a couple pair of socks someplace and give those little fellows a try. Below is the link with the tutorial on how to duplicate these cuties. Aren't these cute? 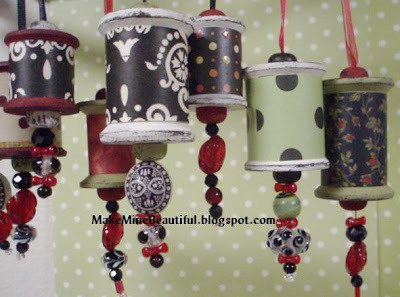 Spools, beads, fabric or paper! Another pretty little project for your tree. Click on the link beneath the picture for the tutorial. My goodness Annie is so so cute. She has wonderful little lips, what a little peanut. It just makes you smile to see her pictured. Elle and I went out searching antique shops for old christmas ornaments today, and of course we had tons of fun looking for the shiney brights. She is done student teaching and has graduated. Two down, one more to go!! !